With a series of storms heading to the Southland over the next week voluntary evacuation warnings are in place for communities impacted by recent wildfires. With a series of storms heading to the Southland over the next week, voluntary evacuation warnings are in place for communities impacted by recent wildfires. Forecasters expect rain and thunderstorms in parts of SoCal for the next four days, dropping several inches of rain in the area. People living in the burn area of the Holy Fire, which ripped through more than 23,000 acres in Orange and Riverside counties last August, have been issued voluntary evacuation warnings. The communities under voluntary evacuation include: Amorose, Alberhill, Glen Ivy A, Glen Ivy B, Glen Eden, Grace, Horsethief A, Laguna A, Maitri, McVicker A, Rice, and Withrow A. 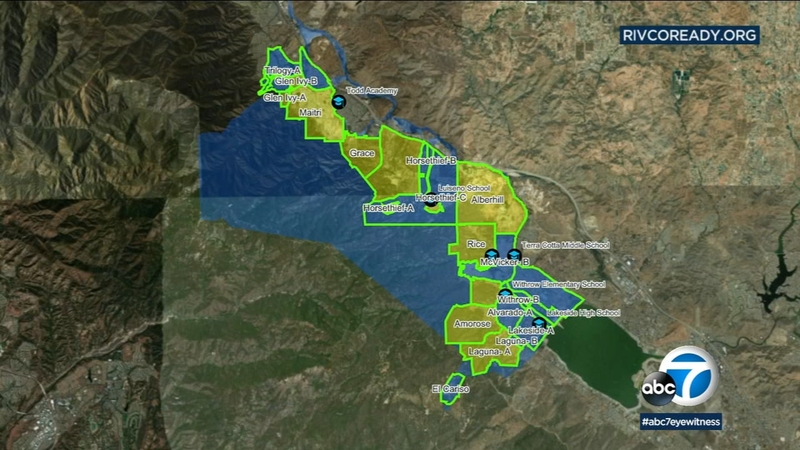 A map from Riverside County shows areas at risk of flooding in the Holy Fire burn areas. Blue means risk for flood and mudflows. Yellow means voluntary evacuation warning. A flash flood watch has also been issued for Orange, Riverside, San Bernardino and San Diego counties starting Monday around noon and lasting until Tuesday. In addition a winter storm warning has been for Los Angeles County. In the burn area of the Cranston Fire, which destroyed about 13,000 acres in Riverside County last summer, authorities say they are not expecting rainfall heavy enough to produce debris flows. Still, residents are urged to maintain a careful watch on their property and the latest weather forecasts. More information on mandatory and voluntary evacuations as well as maps of the risk zones in the Inland Empire is available here. Other areas of the Southland are also preparing for what could be four straight days and several inches of rain. In the Woolsey Fire area, residents are being warned to prepare for possible mudslides and debris flows. In the Westlake Village area, a stretch of Highway 23 known as Decker Canyon Road is shut down from Mulholland Highway to Pacific Coast Highway in Malibu because of the mudslide danger. Caltrans crews are also working in many areas to clear storm drains and put up barricades to divert water from homes, while homeowners are putting sandbags up to protect their property.